The factory is shut down so I can't go to work. The school is shut down. I have three kids and their friends in the house, I've run out of milk and bread, and I'm going nuts. So I've changed the furniture layout in the living room, and I need HELP. See? it all made sense there...granted the paint color was better, but still. I think I need to get rid of the monster TV armoire. But where to put a TV?? And I could slipcover the red chairs...but I've got a red flowered rug! I think I want to move in the direction of green/yellow/blue, rather than green/yellow/RED. Or not. ?!? If anyone has any advice, I desperately need it!! Can't wait to see what you do! Good luck! Hey Katy! Thanks for the stopping by! Here is the link to the fabric in my kitchen. Glad you liked it!! But back to your living room--what if you took out just one of the red chairs and the big ottoman. That might help a little...?? And then add a blue throw over the red chair to tone it down, while adding another color to the palette? Angle your couch and rug off the piano wall, and put your green console table behind the sofa...then move your piano under the starburst. And only use one red chair with a blue throw over it? 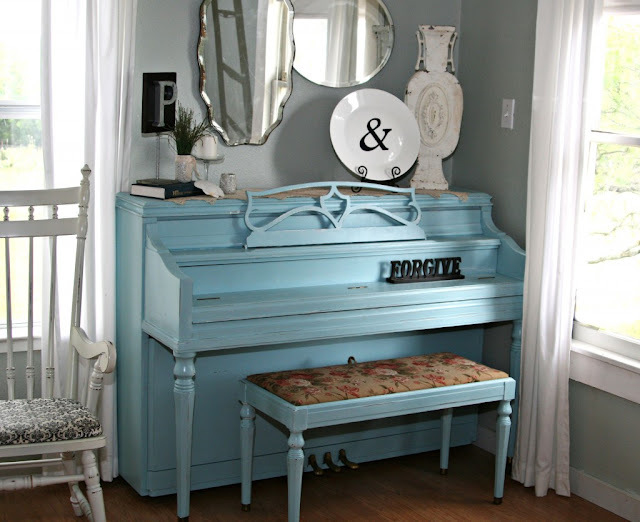 I thought about putting the piano in the foyer where the green sideboard is right now...but it is too weird to have a piano in the foyer??? 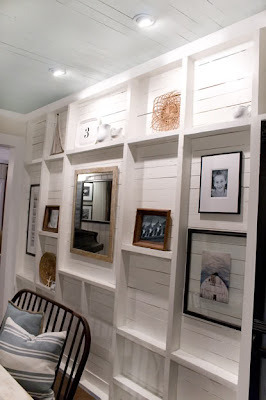 Do the TLC wall on the far wall like you want but make room for a flatscreen in the center (instead of the large framed painting in the inspirations room)?